Does your child say, “I’m okay” to you even though you know they really are not? 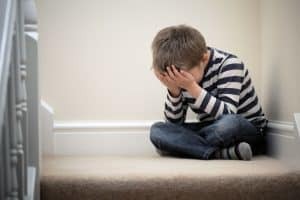 How can you determine if your child is experiencing a normal amount of sadness about a specific situation or clinical depression that warrants therapy with a child psychologist? While this treatable mental illness can run in families, others have no family history of depression at all. Often times, children and teenagers begin to show some depressive symptoms and if they seek help early they can get the support they need to live fulfilling lives. When Is It Important to Seek Help? While it is normal for children and teens to have sadness based on life events such as a family member, friend or pet dying, if a child or teen exhibits several of the symptoms listed above for an extended period of time, it may be important to seek professional support. If a child or teenager has had a personal or family history of depression, are currently undergoing major life changes (i.e. stress or trauma) and/or physical illnesses, these are increased risk factors for clinical depression. Common treatments for depression in children and teens are a combination of Cognitive Behavioral Therapy, Family Therapy, psychoeducation and medication. One person diagnosed with depression is not affected the same way as another person. Therefore, there is not a “one-size fits all” treatment. It is important to talk to your therapist about an individualized treatment approach.